With all the fireplace kits that have hit the market, we’re proud to still build each fireplace completely custom. A fireplace is an investment you’ll only make once in your backyard – why not make it special? It’s amazing how important scale is to a successful landscape. This Culpeper fireplace installation is at Old House Vineyards. From column to column, the fireplace and hearth span nearly 30 feet. Anything smaller would’ve looked like a toy, so I’m happy we built such a hefty fireplace. Because I don’t like boring, plain Jane fireplaces, we used some of the patio materials – travertine and a mauve flagstone – to create the accent panel behind the winery’s logo. When you’re designing an outdoor fireplace for a grand home built in the 1890s, the details matter. I knew I wanted to do something special so I took a ride to one of the architectural salvage yards I visit far too often. They had the stone surround from an old Victorian home that had been demolished. Everything about it was perfect, from the color to the size to the ornate detailing on the mantel. It truly made the fireplace a one of a kind piece. Occasionally we even do indoor fireplaces. The previous spring, we built a seat wall with a stone veneer just outside our clients’ great room. Inside the great room was a fireplace that looked like a relic from a bad 1980s tract home. 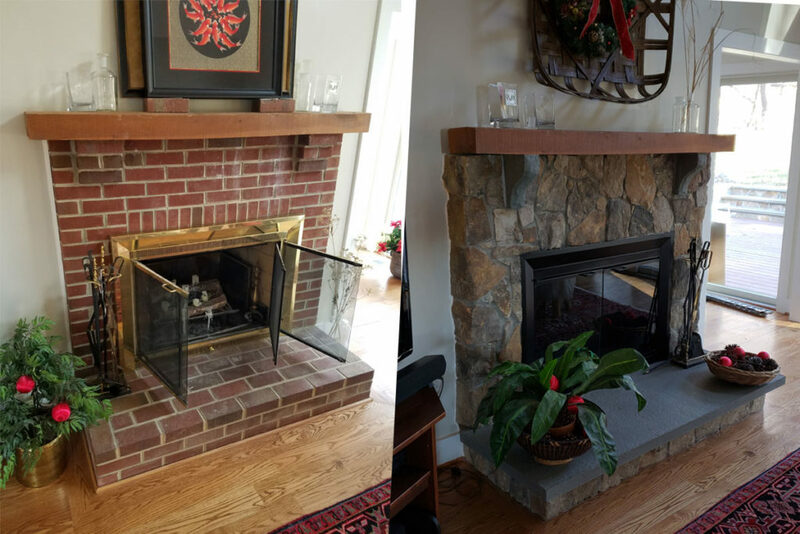 We removed the brick hearth and replaced it with thermaled flagstone, covered over the brick with the same stone we used outside, and had a stone mason in upstate NY fabricate two granite corbels for us, to support the mantel. It’s a wonderful transformation that delights our clients every time they come home. A firepit is a much less formal way to gather friends and family around a fire. Firepits encourage more interaction, and they’re much easier to use for making s’mores. For this more contemporary styled landscape, we tucked a square firepit in the “L” of a seat bench – a seat bench that also contains a water feature! I love this project. A wide, bullnosed travertine cap complements the seat bench and the patio, while the outside is clad with the veneer stone we used throughout. A built-in firepit isn’t always the answer, but a portable firepit from one of the big box stores just won’t cut it either. For this project, we found a company that makes cast iron fire kettles. Too many off-the-shelf firepits are just too small. A 30 inch diameter firepit is pointless! This fire kettle is a whopping 4 feet in diameter, with a bar all around that serves as a footrest.